Samsung approached the Galaxy Note9’s design with equal focus on usability and on empowering users’ expression. As a result, the latest addition to the Note family is not only easy to use, with its customizable, Bluetooth Low-Energy (BLE) connected S Pen, it’s also easy on the eyes, with a thoughtfully refined display and frame design. And with a total of four standout color options, which users are encouraged to mix and match with S Pens and accessories of various hues, the Galaxy Note9 offers users more ways to express their fashion and style. The Galaxy Note9 furthers the Note series’ stunning design heritage with a sleek and square form factor, as well as enhancements that enable users to multitask more efficiently and enjoy immersive multimedia experiences. A cornerstone of Samsung’s design legacy, the Infinity Display is known for its seamless form and captivating visuals. Measuring 6.4 inches, the Galaxy Note9’s Quad HD+ Super AMOLED Infinity Display is the series’ largest yet, offering more room for work, play and everything in between. That means a bigger screen to immerse yourself in a favorite movie or game, and more space to write or create with the S Pen. To amplify users’ immersion, Samsung rounded the corners of the display to a bare minimum, and refined the Galaxy Note9’s barely-there bezels to conceal its iris sensor. The screen itself is also a deeper black, which allows it to blend in with the bezels when the device is off and enhances the overall aesthetic. Other enhancements include the redesigned camera deco, which now matches the color of the device, and the repositioned fingerprint sensor, which is now found beneath the camera. 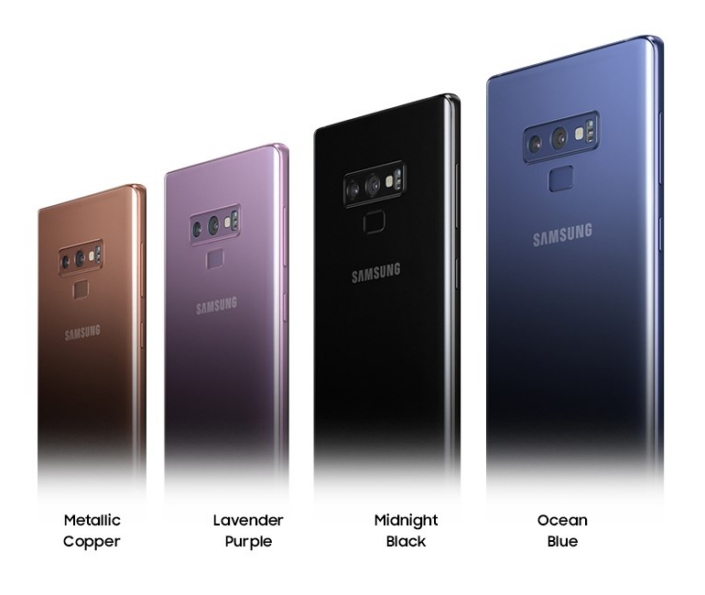 The smartphone’s design is rounded off with a choice of four expressive color options: Ocean Blue, Midnight Black, Metallic Copper and Lavender Purple. 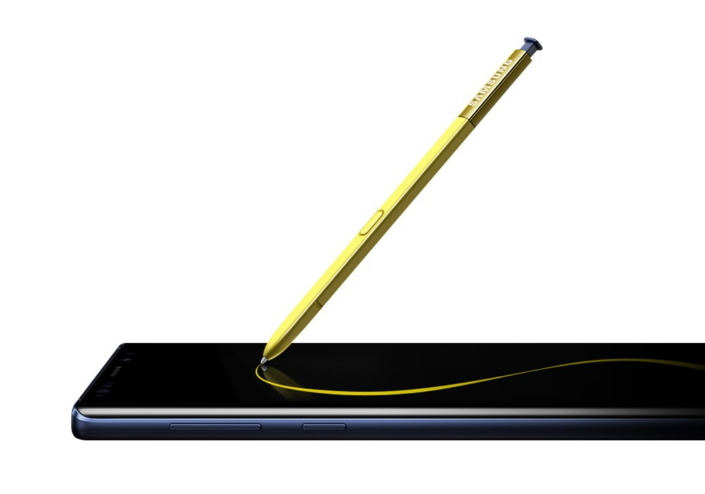 Each Note adds new capabilities to the smartphones’ signature feature: the S Pen. Over the years, these enhancements have unlocked innovative ways for users to manage their mobile lives more comfortably and freely. When designing the Galaxy Note9, Samsung’s team focused on enhancements that would take the S Pen’s ‘freeing’ aspects to the next level, transforming it into more than a tool, but rather a device in its own right, complete with Bluetooth Low Energy (BLE) connectivity and its own independent functions. The S Pen’s individuality is also reflected in aesthetic elements of the Galaxy Note9’s design. For example, unlike the other colorways, which each feature an S Pen in a matching hue, the stylish Ocean Blue model comes with a vibrant Yellow S Pen that stands out from the rest. And because each model’s S Pen is compatible with any other Galaxy Note9, you can easily swap your S Pen for another if you feel like a different color would better suit your style*. 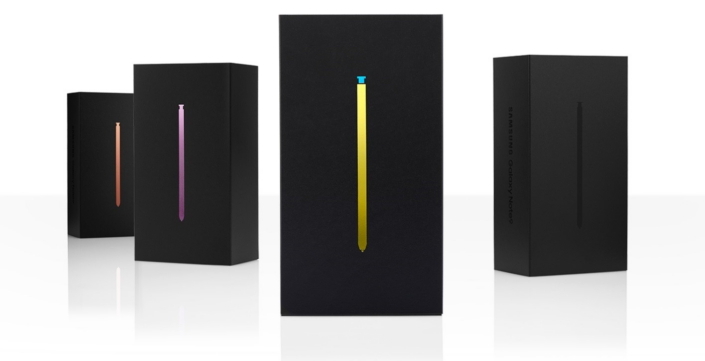 The S Pen’s significance to the line is also reflected in the new flagship’s packaging, which prominently displays an image of the S Pen in place of the devices’ traditional logo. This adjustment was made to honor the S Pen as the symbol of the Note series, and a key reason why the smartphones have garnered countless fans. One of the first things you’ll notice when holding the Galaxy Note9 is just how nicely it sits in the hand. The smartphone’s comfortable contours are the result of a frame design that reflects thoughtful consideration for both usability and aesthetics. The metal frame was forged using a cutting process known as Dia-cutting, which utilizes a fast-rotating artificial diamond tool to create smooth, glossy surfaces that accentuate design details. The process involved tapering the surfaces of the frame that blend into the device’s front and back, and carefully rounding the middle section, which comes into contact with your palm the most. The tapered parts of the frame feature a glossy finish, while the rounded middle section is matte. The resulting frame is sleek and slim, and features an interplay of glossy and matte finishes that complements the Galaxy Note9’s premium design cues. The video above illustrates the dia-cutting process, followed by the coloring procedure of the Galaxy Note9. 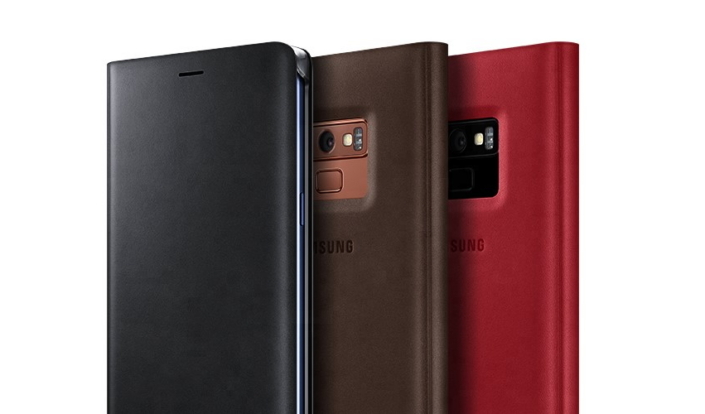 The Galaxy Note9’s accessories selection includes a wide range of stylish covers that offer users more ways to customize their smartphone’s aesthetic. Designed to suit a wide array of tastes, the protective covers span from fine leather to military-grade options. The new Leather Wallet Cover is perhaps the most eye-catching of the bunch. Crafted from genuine calf leather, it features a handy card pocket as well as a soft microfiber lining that helps protect the Galaxy Note9 from scratches. It’s available in a choice of five colors—black, brown, red, blue and yellow—which users are encouraged to mix and match with their Galaxy Note9 to showcase their style. 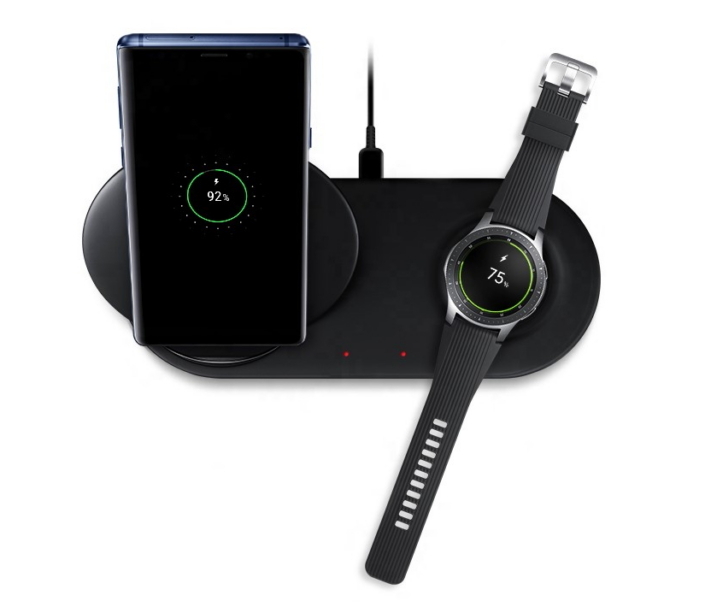 Also included in the Galaxy Note9’s collection of compatible accessories is Samsung’s new Wireless Charger Duo. A combination of the Fast Charge Wireless Charging Stand and the Wireless Charging Pad, the fast-charging two-in-one allows users to quickly charge their phone alongside another Qi-compatible phone or wearable. The charger eliminates the need to fumble with cables each time you need to top up your devices’ batteries, and its built-in stand offers easy access to your phone’s screen. *Each model’s S Pen is also available for individual sale.